For the pedigree and descendants of this nobleman, see —Gent. Mag. vol. LXXIX. Next year he received a summons to parliament, which, as he was then but eighteen years old, the earl of Northumberland censured as at least indecent, and his objection was allowed. When the second Dutch war broke out in 1672, he went again a volunteer in the ship which the celebrated lord Ossory commanded, and who represented his behaviour so favourably, that he was advanced to the command of the Catharine, the best second-rate ship in the navy. He afterwards raised a regiment of foot, and commanded it as colonel. The land forces were sent ashore by prince Rupert: and he lived in the camp very familiarly with Schomberg. 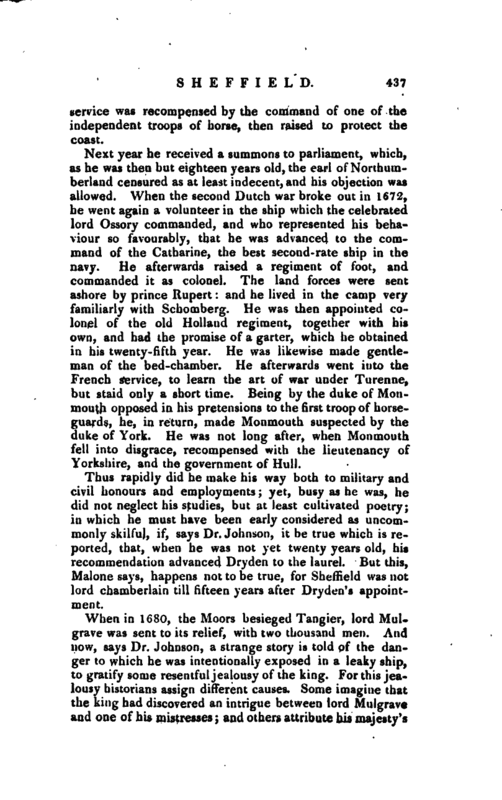 He was then appointed colonel of the old Hollaud regiment, together with his own, and had the promise of a garter, which he obtained in his twenty-fifth year. He was likewise made gentleman of the bed-chamber. He afterwards went into the French service, to learn the art of war under Turenne, but staid only a short time. Being by the duke of Monmouth opposed in his pretensions to the first troop of horseguards, he, in return, made Monmouth suspected by the duke of York. He was not long after, when Monmouth fell into disgrace, recompensed with the lieutenancy of Yorkshire, and the government of Hull. 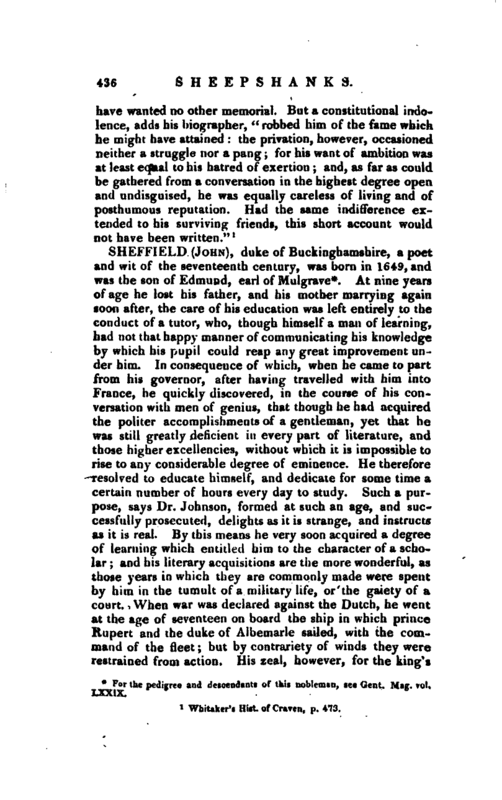 Thus rapidly did he make his way both to military and civil honours and employments; yet, busy as he was, he did not neglect his studies, but at least cultivated poetry; in which he must have been early considered as uncommonly skilful, if, says Dr. Johnson, it be true which is reported, that, when he was not yet twenty years old, his recommendation advanced Dryden to the laurel. 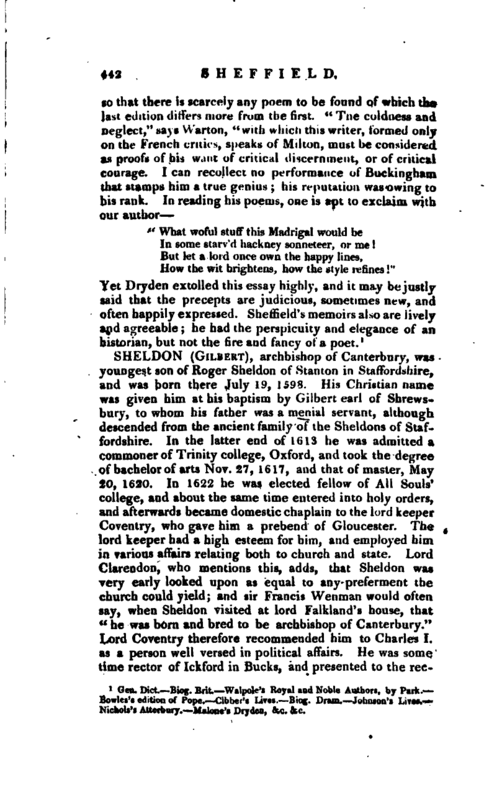 But this, Malone says, happens not to be true, for Sheffield was not lord chamberlain till fifteen years after Dryden’s appointment. When in 1680, the Moors besieged Tangier, lord Mulgrave was sent to its relief, with two thousand men. 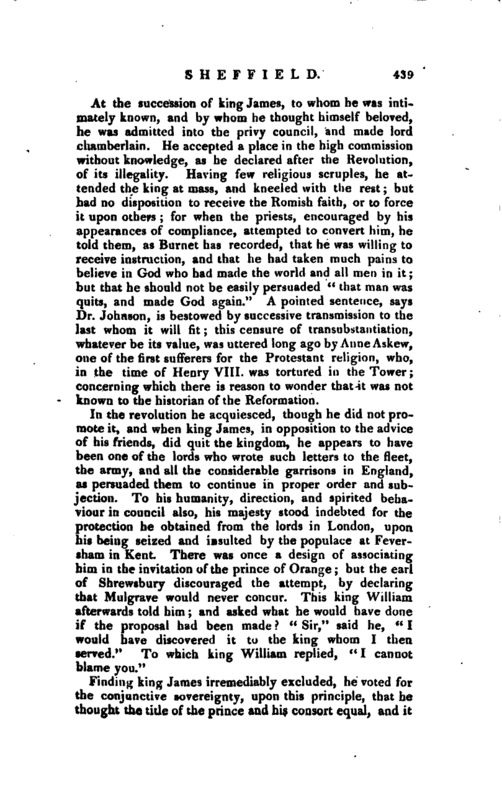 And now, says Dr. Johnson, a strange story is told of the danger to which he was intentionally exposed in a leaky ship, to gratify some resentful jealousy of the king. For this jealousy historians assign different causes. Some imagine that the king had discovered an intrigue between lord Mulgrave and one of his mistresses; a*nd others attribute his majesty’s | resentment to proposals of marriage, which his lordship was bold enough to make to the princess Anne. It is added, that " be the cause what it would, it is apparent it was intended that lord Mul grave should be lost in the passage; a vessel being provided to carry him over, which had been sent home as unserviceable, and was in so shattered a condition, that the captain of her declared he was afraid to make the voyage. On this his lordship applied, not on)y to the lord high admiral, but to the king himself. These remonstrances, however, were in vain no redress was to be had and the earl, who saw the trap laid for him by his enemies, was compelled to throw himself into almost inevitable danger to avoid the imputation of cowardice, which of all others he had the greatest detestation of. 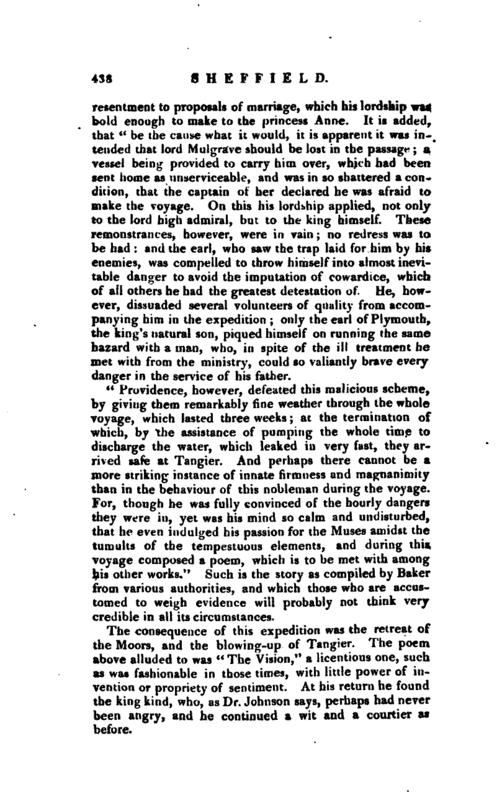 He, however, dissuaded several volunteers of quality from accompanying him in the expedition; only the earl of Plymouth, the king’s natural son, piqued himself on running the same hazard with a man, who, in spite of the ill treatment he met with from the ministry, could so valiantly brave every danger in the service of his father. “Providence, however, defeated this malicious scheme, by giving them remarkably tine weather through the whole voyage, which lasted three weeks; at the termination of which, by the assistance of pumping the whole time to discharge the water, which leaked in very fast, they arrived safe at Tangier. And perhaps there cannot be a more striking instance of innate firmness and magnanimity than in the behaviour of this nobleman during the voyage. For, though he was fully convinced of the hourly dangers they were in, yet was his mind so calm and undisturbed, that he even indulged his passion for the Muses amidst the tumults of the tempestuous elements, and during this voyage composed a poem, which is to be met with among his other works.” Such is the story as compiled by Baker from various authorities, and which those who are accustomed to weigh evidence will probably not think very credible in all its circumstances. The consequence of this expedition was the retreat of the Moors, and the blowing-up of Tangier. The poem above alluded to was “The Vision,” a licentious one, such as was fashionable in those times, with little power of invention or propriety of sentiment. At his return he found the king kind, who, as Dr. Johnson says, perhaps had never been angry, and he continued a wit and a courtier as before. | At the succession of king James, to whom he was intimately known, and by whom he thought himself beloved, he was admitted into the privy council, and made lord chamberlain. He accepted a place in the high commission without knowledge, as he declared after the Revolution, of its illegality. Having few religious scruples, he attended the king at mass, and kneeled with the rest; but had no disposition to receive the Ilomish faith, or to force it upon others; for when the priests, encouraged by his appearances of compliance, attempted to convert him, he told them, as Burnet has recorded, that he was willing to receive instruction, and that he had taken much pains to believe in God who had made the world and all men in it; but that he should not be easily persuaded “that man was quits, and made God again.” A pointed sentence, says Dr. Johnson, is bestoweo^ by successive transmission to the last whom it will fit; this censure of transubstantiation, whatever be its value, was uttered long ago by Anne Askew, one of the first sufferers for the Protestant religion, who, in the time of Henry VIII. was tortured in the Tower; concerning which there is reason to wonder that it was not known to the historian of the Reformation. Finding king James irremediably excluded, he voted for the conjunctive sovereignty, upon this principle, that he thought the title of the prince and his consort equal, and it | would please the prince their protector to have a share irt the sovereignty. This vote gratified king William; yet, either by the king’s distrust, or his own discontent, he lived some years without employment. He looked on the king with malevolence, and, if his verses or his prose may be credited, with contempt. He was, notwithstanding this aversion or indifference, made marquis of Normanby in 1694, but still opposed the court on some important questions; yet at last he was received into the cabinet council, with a pension of three thousand pounds. On the accession of queen Anne, that princess, who ever bad a great regard for him, loaded him with employments and dignities. In April 1702, he was sworn lord privy seal, made lord lieutenant and custos rotulorum for the north riding of Yorkshire, and one of the governors of the Charter-house; and the same year was appointed one of the commissioners to treat of an union between England and Scotland. On the 9th of March, 1703, he was created duke of Normanby, and on the 19th of the same month duke of Buckinghamshire, there being suspected to be somewhere a latent claim to the title of duke, of Buckingham. In 1710, the whig ministry beginning to give ground, his grace, who was strongly attached to tory principles, joined with Mr. Harley, afterwards earl of Oxford, in such measures as brought about a change in the ministry, shook the power, of the duke and duchess of Marlborough, and introduced Mr. Harley, the earl of Shrewsbury, lord Bolingbroke, &c. into the administration. Her majesty now offered to make him chancellor, which he refused, but in 1711 was appointed steward of her majesty’s household, and president of the council, and on her decease, in 1713, was nominated one of the lords justices in Great Britain, till the arrival of king George I. from Hanover. The second line of the epitaph stands as follows on the duke’s monument: “Incertus morior, non perturbatus;” and the words “Christum adveneror” are omitted, at the desire, as is said of bishop Atterbury, who thought the verb adveneror" not full enough, as applied to Christ. Some displeasure having been expressed at this epitaph, it was defended in form i>y Dr. Fiddes, who did not understand it. See our account of Fiddes, vol. XIV. He left only one legitimate son behind | him, named Edmund, who died in the bloom of youth. It is observable, that the duke’s three wives wer all widows. 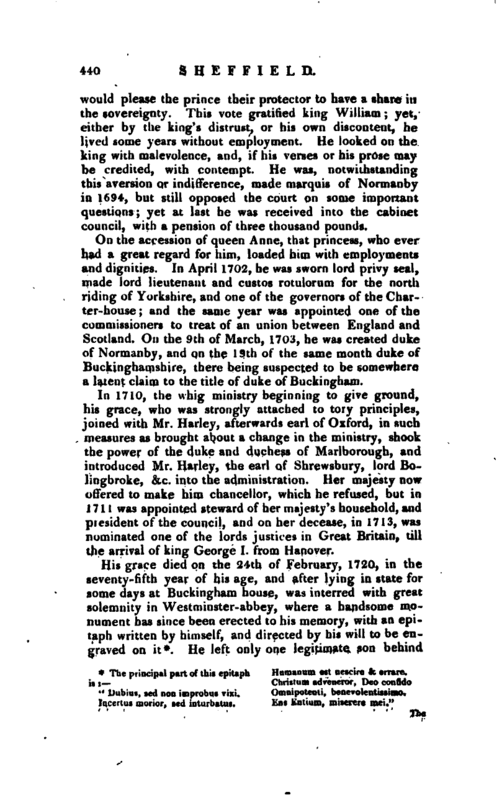 The duchess died in 1742. She published a splendid edition of his works in 1723, 2 vols. 4to, which were afterwards reprinted in 1729 and 1740, 2 vols. 8vo. The first contains his poems upon various subjects: the second, his prose works, which consist of historical memoirs, speeches in parliament, characters, dialogues, critical observations, essays, and letters; but the edition of 1729 is castrated, some particulars relating to the revolution in 1723 having given offence. 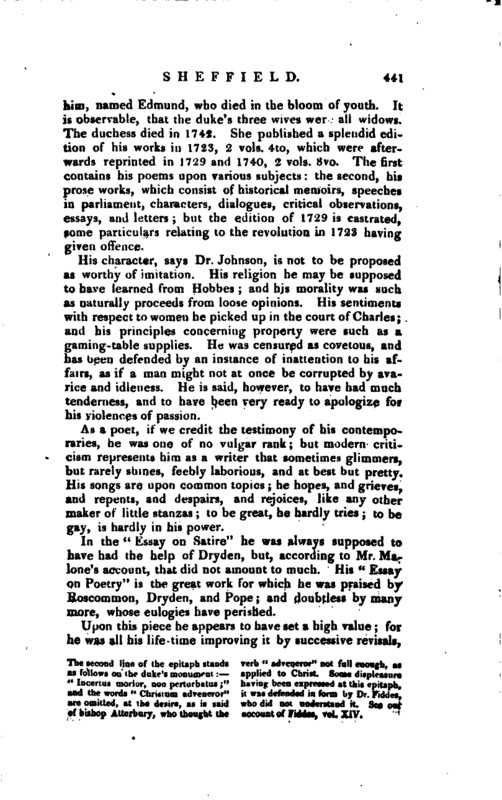 His character, says Dr. Johnson, is not to be proposed as worthy of imitation. His religion he may be supposed to have learned from Hobbes; and his morality was such as naturally proceeds from loose opinions. His sentiments with respect to women he picked up in the court of Charles; and his principles concerning property were such as a gaming-table supplies. He was censured as covetous, and has been defended by an instance of inattention to his affairs, as if a man might not at once be corrupted by avarice and idleness. He is said, however, to have had much tenderness, and to have been very ready to apologize for his violences of passion. As a poet, if we credit the testimony of his contemporaries, he was one of no vulgar rank; but modern criticism represents him as a writer that sometimes glimmers, but rarely shines, feebly laborious, and at best but pretty. His songs are upon common topics; he hopes, and grieves, and repents, and despairs, and rejoices, like any other maker of little stanzas; to be great, he hardly tries; to be gay, is hardly in his power. In the “Essay on Satire” he was always supposed to have had the help of Dryden, but, according to Mr. Malone’s account, that did not amount to much. His “Essay on Poetry” is the great work for which he was praised by Roscommon, Dryden, and Pope; and doubtless by many more, whose eulogies have perished. In some starv’d hackney sonneteer, or me! How the wit brightens, how the style refines!" Gen. Dirt. Biog. Brit. Walpole’s Royal and Noble Authors, by Park. Bowies’s edition of Pope. Cibber’s Lives. Biog. Dram. Johnson’s Lives. Nichols’s Atterbury. Malone’s Dryden, &c. &c.